When hearing of this attack on the radio yesterday, I initially thought that it may actually have been a "real" tragic event. There was no claim of terrorism, there were no witnesses claiming that the driver was heard yelling "Allah Akbar" and no apparent reason for faking such an event. of course, I had a feeling that this was just another media staged faked event and could not wait to get home from work to do some research. After doing a bit of research, I found dozens of pics online of the van with a smashed up front end with NOT A SINGLE DROP OF BLOOD anywhere to be seen. DId the driver go through a car wash after ramming down dozens of pedestrians, killing 10 and injuring 15? Next I discovered a video of the arrest. A sole policeman arrests the driver (caught on video) and the driver brandishing an object and pretending to shoot at the officer. The driver can be heard on the video asking the policeman to shoot him. The officer does not duck down beside his car but instead moves into the open, but realizes that the siren is making it difficult to hear the exchange he reaches back into the car to TURN OFF THE SIREN so that the video can pick up the audio of the van driver asking to be shot. I cannot imagine that anyone with a brain in their head who watches that video can actually believe that it was a" real" event. The "takedown" video can be seen at this webpage on the Maclean's news website. I was surprised to see that there were no Arab / Islamic / terror / Muslim linkages on the surface, however, all is not as it seems. First of all, the van attack has been 'used' repeatedly now so it matters not that it is not a 'terror' related incident. In the minds of people, whenever they hear of a 'van attack' they are conditioned to assume it is terror (Islamic) related. In essence they join the dots, where there are none. This happened beautifully last year, June 25th 2017 where an accident involving Eid prayers 'occurred' sandwiched neatly between two alleged terror incidents. So.....people will automatically link the 3 when they are in fact not linked whatsoever. The Sun decided to mention terror anyway. I quote the headline and sub headline below to which I refer. "EID CAR SMASH Muslim worshippers rush to help after out-of-control car ploughs into families at Eid prayer gathering in Newcastle leaving six injured just a week after Finsbury Park attack"
"Woman, 42, arrested as police say the incident is not terror-related"
Back to Toronto. The most obvious thing about the alleged Toronto van attack is the dramatic filmesque standoff, with the relatively uninterested 3 young folk walking out of the shot. Despite the possible street execution about to happen, they move away in the manner as if they were being bothered by a drunken street tramp. However, there were linkages to Muslims and Arabs and Terrorism, albeit symbolic or associative. 1.) The new group who Alek Minassian represented is/was/are called INCEL, (almost a homophone) to ISIL (another shortening for ISIS). 2.) In the BBC video, there is a fantastic almost frame filling shot of arabic script on the windows behind the alleged incident. This enables the mental linkage of a shoot out and Muslims. Unfortunately I could not embed the BBC video, but have found one from YouTube. The video is 'shot' from another angle which shows the Arabic script, albeit much less impressively than the BBC very own version. Pay attention from the 1 second mark. The entire scene ensues (is choreographed) using this Arabic script as the backdrop. Not subtle at all. This goes to show the thought (in my humble opinion) that goes into continuing to malign and portray certain groups in certain ways that later become completely cemented in the minds of the public. Eventually, you cannot argue that Muslims are not terrorists because people have been so firmly persuaded. The magic here is that they have no idea how they became so certain! To see the almost frame filling BBC arabic script version of the video, follow this link and it occurs around the 40 second mark. Here is the police news conference hosted just over 24hrs after this event happened. Extremely odd that they would be appealing to the general public for help in identifying the alleged victims of this event. Please call us if you are missing someone, they may have died in a van attack. Seriously? If passports and wallets can survive 9/11, they wouldn't get destroyed in a van attack would they? omaxsteve » April 24th, 2018, 2:52 pm wrote: After doing a bit of research, I found dozens of pics online of the van with a smashed up front end with NOT A SINGLE DROP OF BLOOD anywhere to be seen. DId the driver go through a car wash after ramming down dozens of pedestrians, killing 10 and injuring 15? when analyzed carefully, actually prove that this entire event was just another in the long line of fake news stories, carefully scripted and staged to make it look real. here is the dash cam video: pay attention to the police car "in pursuit" and how it resembles the car of the "heroic" police actor who eventually peacefully arrests the suspect. It so happens that this video shows the Ryder rental van, already damaged, driving on the street, not the sidewalk, blocks away from the site of the carnage. there had never been any mention, prior to this video surfacing of the van driver trying to "get away" or being pursued by police. Here is another video from a CCTV surveillance camera's that "caught" the van driving by; the video explains how the location of the camera (further along the sidewalk from the spot where supposed victims have been run down) shows that t has no visible damage. part 2 here discussing the speed the van was traveling based on the time stamps and locations of the different CCTV footage videos. Not the exact same van, but a white van just the same, parked on the sidewalk about 20 metres east of the spot where the van driver was arrested. That is interesting omaxsteve. This was apparently taken in September 2017. Is some element of staging at work? We know that logically, any business operation, even a PsyOp, must be planned many months in advance. Sometimes years. So if there is a "symbol" here that people can point to for months ahead of time as they drive by, meetings can take place in cars. You see that van after we turn this corner? This is roughly the area we want to have the arrest of our "villain" take place. It is pretty classic for an operation to dress itself up as a "moving", "remodeling" or "finance" place. But this possibility might be moot if we actually saw that there wasn't much hiding room in a suspicious area. And anyway, it could just as likely be a true coincidence. It's not as if vans are uncommon. here is the best image I could find depicting the route the Van driver supposedly followed. 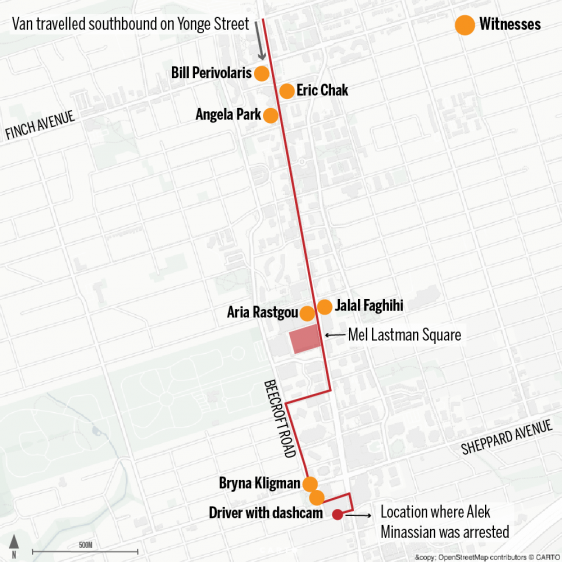 Does anyone else find it incredible that after a 7 minute rampage , mowing down pedestrians, on one of the busiest streets (Yonge street) in Canada's largest city that when the driver pulled over about 50 meters from Yonge street there was only ONE police car and one police officer nearby to apprehend him? If you look back at the video of the arrest up above you will notice that the arresting officer actually paused to take the time to turn off his siren right in the middle of the stand -off. Conspicuous by its absence is that there are not dozens of other sirens in the background with all the Ambulances and other police cars that must surely have been rushing to the scene. I am working on calculating the speed and distance and timing form the "dash cam" video posted above to figure out how far behind the pursuing, and apparently eventual arresting officer was trailing the suspect van. The police have made it clear that the entire episode, from the first 911 call of a pedestrian being struck to the actual arrest lasted a total of 7 minutes. AS soon as I can calculate the total distance traveled, I will be able to figure the average speed of the "killer" van. Witnesses have claimed they saw the van traveling at speeds of 60 kilometers to 60 miles per hour per hour. I suspect that the average speed was closer to 10 Kilometers per hour, a speed at which most any able-bodied person would easily be able to avoid. Unfortunately, personal and work issues are taking up an extreme amount of time right now so I cannot devote as much time as I would like to in uncovering this latest staged media hoax. Anyone out there, who may be interested, please feel free to look at the videos I have posted and add your thoughts and comments. I have a hunch that the arrest and the dashcam video (Van going through the intersection on Beechcroft Rd) May have been filmed at different times. If anyone has the time and expertise to look at these videos for the sun shadows it may prove very interesting. I personally don't believe in coincidences. Catching that van going through the intersection must have been planned and orchestrated. Also, the fact that multiple (at least three different angles) bystanders just happened to be on position to film the standoff and arrest, yet NOT A SINGLE PERSON was able to post a single photo, or video depicting any damage to person or property is simply mind-boggling. Eye witness interview to the Toronto Van Attack. Can't help notice the very high percentage of immigrants/temporary visitors to Canada involved in this event. Citizenship for oneself and family would be a powerful incentive to go along with insurance and victim GoFundMe money. In this interview, she recounts her horrifying experience of almost dying. My favorite line is at 1:08 "He hit me with the side mirror, a little bit, in my head". Impressive Woman.